David Lloyd George was one of our more colourful Prime Ministers and is remembered in the song 'Lloyd George Knew my Father'. Whether he did or not, he certainly knew Pwllhelli golf course because he performed the official opening ceremony in 1909. 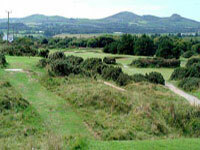 The club had been formed in 1900 but only as a nine-hole course designed by Tom Morris of Hoylake amid the dunes. The ubiquitous course designer James Braid added a further nine and Lloyd George, a keen golfer who was born in nearby Criccieth, was happy to add it to the many courses he played in the area. The nine holes added by Braid take you over gentle Links which contrasts sharply with the original nine on traditional linksland and together they make a delightful test. Pwllheli claim that the clubhouse is closer to the sea than any in the UK and the views over Cardigan Bay and up to Snowdonia provide a superb backcloth.